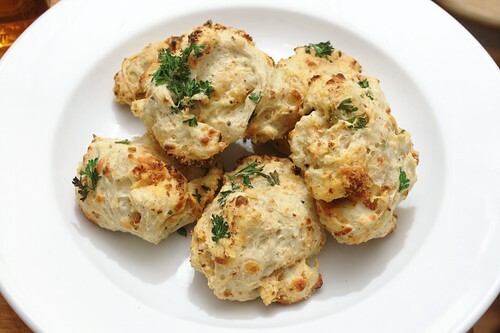 garlic, mozzarella and bacon fat biscuits, originally uploaded by aarn! +13th October, 2010+. cut 4T. of chilled bacon fat, mixed with a few cloves of olive oil poached garlic, into 2c. of all-purpose flour, 3t. baking powder, 1T. salt and 1t. fresh cracked pepper. gently mixed whole milk into the dry ingredients until the dough was bound and slightly on the sticky side. folded in grated whole milk mozzarella, shredded pepperoni and some fresh parsley. formed into eight small biscuits and slid onto a dusted baking stone in a 425-degree oven for about 15-min, until brown on the top and crispy on the bottom. let cool for a few minutes and then served. Oh wow..those look tasty. Of course..there's bacon fat involved. My mouth is watering, again!